MinnesotaHauntedHoses.com recently sat down with Jen Nielsen of Northern Frights Haunted Attraction, to discuss what's new at the haunt for the 2018 Halloween Season! 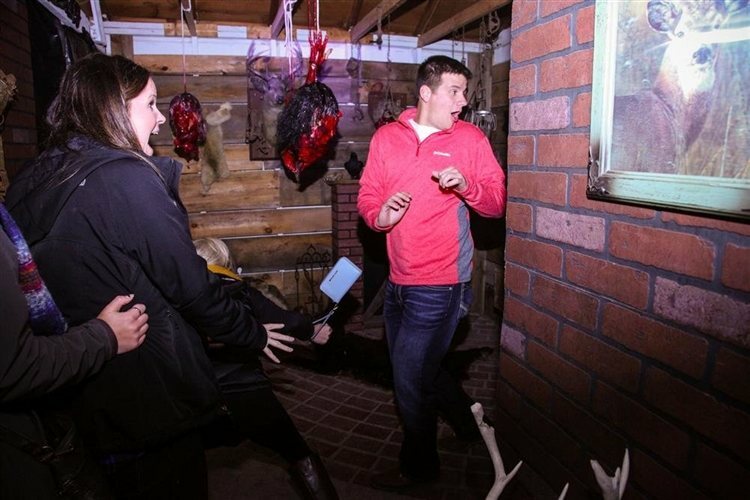 Located in Garden City, this haunt is sure to get your blood flowing! Don't miss out on what's in store for this year. What's new at Northern Frights Haunted Attraction for 2018? Do you have any new rides, attractions, or special features that Haunt Seekers should know about? New this year is a totally revamped Zombie Outbreak, and Phobia's. We have re-routed Zombie Outbreak to enter and exit in a different area along the river, scenes and scares have also been changed. Phobia's totally different from last year, lots of new rooms, hallways, and scares. Killer Clowns in 3D has some new cool stuff to look at, and some insane new clowns. Last but not least, Legends has new rooms, tech and a complete redesign and a scare at the end that has people running out as fast as they can! I am super excited and proud of the build this year, it got great reviews during our soft open. I am most excited about our Actors, the talent this year is just top notch! We had over 50 returning staff and picked up a few new superstars. Great actors make all the difference! What differentiates Northern Frights Haunted Attraction from other local haunts in Minnesota? Oooh, lots of things. MN Legends was the theme of our first attraction. All haunts have themes, we wanted to dig deep into Minnesota folklore and use those stories to create a unique haunted experience. Each room connects with our guests on a deeper level because of that connection to Minnesota. Our setting also sets us apart from other Haunts in Minnesota. We are located at the Blue Earth County Fairgrounds, which is a small old fairgrounds shadowed by huge old growth oak tress and nestled on the bend of the Watonwan River. When the sun goes down and the moon comes up shadowing the gnarley oak trees, the grounds themselves give off that haunted feeling. How long has Northern Frights Haunted Attraction been in business? Can you tell us a bit more about Northern Frights Haunted Attraction's history? 2018 is Northern Frights third season of Haunting. The vision of the masterminds behind Northern Frights, Eric Weiss and Jen Nielsen, has had time to gel together over the past three years, and has really come together to create a memorable experience for our guests. What's your favorite experience since opening Northern Frights Haunted Attraction? There is nothing quite like opening weekend standing back and watching everything you worked so hard on finally coming to fruition. I just love walking the back halls and peeking in on the scares in action. One of my favorite things is to stand at the exits and watch people come running out screaming and laughing and having a great time. How long is a typical haunt experience at Northern Frights Haunted Attraction from start to finish? Depending on wait times you should be able to get through everything in 1.5 - 2 hrs. On a scale from 1 to 10, how scary would you say Northern Frights Haunted Attraction is? Why? You only get scared if you want to. If you love haunts and love getting scared you won't be disappointed. One of our Que line actors last year scared a group as they were getting out of their car so bad they got back in and left! We advise an age limit of 12 years old and up. Our actors do not touch guests. On a scale of 1 to 10, I give it an 8, due to no touching. Can Northern Frights Haunted Attraction accommodate large groups? How many people can experience Northern Frights Haunted Attraction together as a group? We regularly accommodate large groups and have special group pricing. Does Northern Frights Haunted Attraction offer any special deals, discounts, or coupons? $2 off coupons available at Hy-vee and Quick Marts.